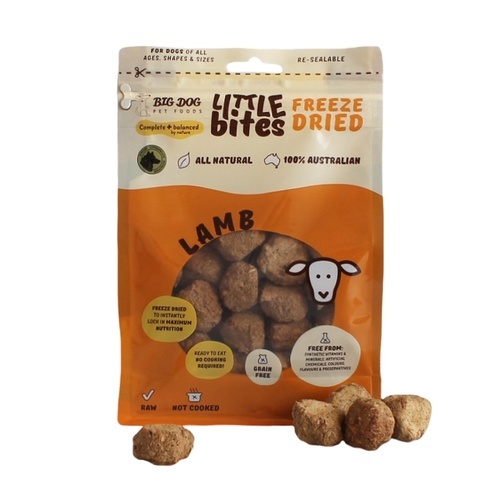 Using 100% grass-fed Australian lamb, Big Dog's Freeze Dried Lamb Little Big Bites are a high quality, species-appropriate diet or treat for dogs of all shapes and sizes. 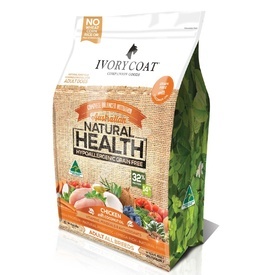 This mixed-protein recipe provides a variety of high quality amino acids coming only from fresh, raw Australian produce, with the addition of offal for concentrated naturally occurring vitamins and minerals as well as crushed bone for calcium, collagen, bone marrow and other nutritional building blocks for healthy bones and joints. All recipes also contain a variety of fresh fruits, vegetables and other healthy ingredients to provide a naturally balanced source of nutrition full of anti-inflammatory, immune supporting and health promoting ingredients. Big Dog Freeze Dried Little Bites are delicious bites of raw healthy goodness using the same high quality recipes as the Big Dog raw diet range, only in smaller serve sizes and freeze dried for all the health benefits of raw nutrition with the convenience of dry food! Available in 2 flavours, Freeze Dried Little Bites are naturally complete and balanced so can be used as the primary source of your pets nutrition while travelling, or integrated into their everyday diet as healthy treats and toppers. Freeze drying is the best way to snap lock in all of the nutrients found in fresh raw food by instantly freezing the product, removing 70% of the moisture whilst locking in all of the micronutrients in the food. This allows nutrients to survive until rehydrated by eating or adding some room-temperature water and rehydrating into raw unprocessed healthy food! Just remember when not rehydrating freeze-dried food to have plenty of fresh drinking water available for your dog. 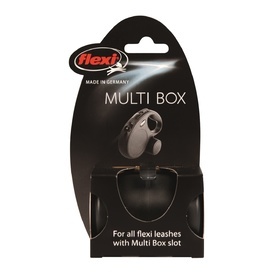 TREATS / TOPPERS: If using Big Dog Little Bites as treats or toppers, integrate into your dog’s diet taking their total energy requirements into account. MEALS: If using Big Dog Little Bites as your dog’s primary source of nutrition, feed 3 Little Bites per kg of body weight daily. For puppies under 12 months, pregnant or lactating dogs or working active dogs with higher energy requirement, double the daily serve size. For dogs 5 kg and over, consider Big Dog Big Bites or Big Dog raw patties for an economical feeding option for larger daily feeding amounts. To rehydrate into healthy raw food simply add room-temperature water to the Bites, crumble and mix. For each Little Bite add 6 mL of water to reconstitute (a metric teaspoon is approx. 5 mL). When using as treats or not rehydrating freeze-dried food, remember to have plenty of fresh drinking water available for your dog. Whole fish (salmon & sardines), chicken, finely ground chicken bone & cartilage, beef & lamb heart, beef & lamb liver, beef & lamb kidney, seasonal fruits, vege & herbs (kale, spinach, broccoli, bok choy, silver beet, carrots, celery, beetroot, lettuce, cucumber, capsicum, apple, orange, pear, tomato, strawberry, ginger & parsley), wheatgrass, cold pressed ground flaxseed, whole egg, coconut oil, kelp powder (brown seaweed), turmeric, live probiotics, prebiotics, garlic. FREEZE DRIED: Protein 45%, Fat 42%, Fibre 1% Maximum, Calcium 0.8%, Phosphorus 0.5%, Calcium: Phosphorus Ratio 1:0.6, Ash 2.8%, Moisture 2% Maximum. REHYDRATED: Protein 13%, Fat 12%, Fibre 1% Maximum, Calcium 0.8%, Phosphorus 0.5%, Calcium: Phosphorus Ratio 1:0.6, Ash 2.8%, Moisture 69%. Some of the ways to integrate Big Dog Freeze Dried Little Bites into your dogs' diet are as healthy training treats, meal toppers, great for smaller eaters, use with mental stimulation toys and some slow feeding devices as well as for healthy gap feeding. The convenience of healthy raw food, freeze dried makes Little Bites perfect for travel with no need to refrigerate or freeze!